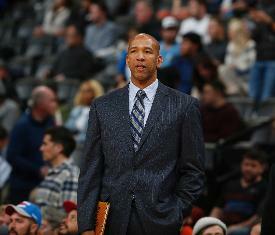 The Los Angeles Lakers on Saturday received permission to discuss their opening for head coach with Philadelphia 76ers assistant Monty Williams, according to multiple reports. After spending the previous two years in the San Antonio Spurs' front office following the death of his wife Ingrid in 2016, Williams got back into coaching as Brett Brown's top assistant with the 76ers. The 76ers on Saturday lost Game 1 of a first-round series against the Brooklyn Nets. Williams previously was head coach of the New Orleans Pelicans from 2010-15, compiling a 173-221 record. His teams reached the playoffs in his first season (2010-11) and his last (2014-15). He also was an assistant with the Oklahoma City Thunder. He left as associate head coach in the aftermath of his wife's death and relocated with his children to San Antonio, where his extended family lives. Lue has been out of coaching since he was fired by the Cavaliers after an 0-6 start to the 2018-19 season.